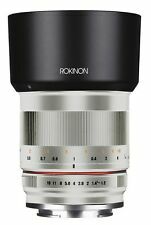 The Rokinon 50mm Lens is also convenient and easy to use with a smooth focus ring, compact size and an included detachable lens hood. Image results are bright, sharp & clear with high resolution & super low distortion. 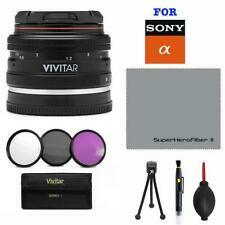 VIVITAR 50MM HD F2.0 LENS FOR SONY E MOUNT. Zoom into a great picture with the Vivitar DSLR 50mm Lens F2.0. Surrounded by a steel barrel design and shielded with a multi-coated optical glass, this lens is protected against any hazards leaving you with the capabilities of taking great quality photos even after prolonged use. Lens features Rokinon Ultra Multi-Coated (UMC) optical glass for sharp, clear images. 50mm fixed focal length with aperture range of f1.2-f16. Removable Lens Hood. Prices do change frequently. 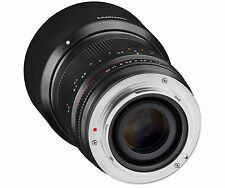 Rokinon 50mm f/1.2 Lens for Sony E (Black) Combo DealLens Specs Vari-Angle Prism Image Stabilization. 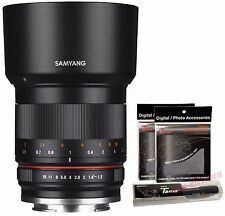 Samyang 50mm F1.2 AS UMC CS has a significantly low F number (F1.2). The 50mm F1.2 is a multi-purpose lens, especially including portraits. l Ultra Multi Coating (H-ASP) technology of Samyang Optics. In Holding in your local custom. Crop factor 1.5. Completeness:Lens, manual, box, case. We will try do everything we can to resolve the issue. It will be changed or repaired in Moscow. If you receive your item,and you is satisfied. PORST COLOR REFLEX. [Fujica -> NEX mount]. UMC 50mm f/1.2. This lens isFULLY manual lens. VISUALLY: PERFECT-. Lens type: single-focus lens. Lens Mount: Sony E. Type: standard lens. Lens construction: 7 9 sheets group. Color: Black. Focal length: 50 mm. Focal length (wide angle side): 50 mm. Zoom into a great picture with the Vivitar DSLR 50mm Lens F2.0. Surrounded by a steel barrel design and shielded with a multi-coated optical glass, this lens is protected against any hazards leaving you with the capabilities of taking great quality photos even after prolonged use.